The University of Colorado dates back to 1883 with the establishment of the medical school on the Boulder campus. CU Denver came to be in 1912, originally as an extension of CU Boulder, and finally gained its independence in 1973. In 1985, the Denver Business School was established. The Denver Business School maintains two locations: one located in the heart of downtown Denver in its own dedicated building, just blocks from the bustling 16th Street Mall and less than a mile from Coors Field, home of the Colorado Rockies. The other location is in South Denver, 20 miles south of the city, in the Liniger Building. Prior to 1990, students took classes on several different campuses within the CU system, including Boulder, Auraria, and Anschutz. In 1990, CU Denver acquired the current buildings in the prime downtown location, allowing its students to enjoy a centralized campus experience. The school is walking distance from the large majority of Denver businesses, providing perfect opportunities for both internships and networking events. The Denver Business School is located less than 30 miles away from the Denver International Aiport. In 2012, the Denver Business School moved into its own building within the downtown campus. Moving into this building allowed the faculty, staff, classrooms, and research centers to exist together under one roof for the first time after having been previously scattered across 15 different locations. The Business School building boasts 120,000 square feet of classrooms, seminar rooms, a conference room, a large commons area, and a café. The CU South Denver location, 20 miles south of the downtown campus, boasts 11,000 square feet of classroom space and unique spaces like galleries, a theatre, and a ballroom. The Denver Business School employs 160 faculty members across ten specialized disciplines: accounting, business analytics, finance, entrepreneurship, health administration, information systems, international business, management, marketing, and taxation. The 11-month, full-time program has 13 faculty members specifically dedicated to that degree option. The Denver Business School enrolls approximately 611 students in its numerous MBA programs. 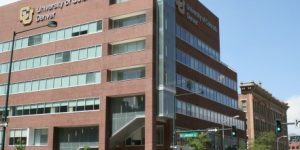 In addition to the 11-month, full-time MBA, CU Denver Business School also offers a flexible Professional MBA, an Executive MBA, a Health Administration MBA, as well as several dual degree programs with other CU Denver graduate schools. The Professional MBA is ideal for students with varying schedules and an inability to commit to the accelerated 11-month MBA, while the Executive MBA is meant to be completed in tandem with a full-time job, usually somewhere around two years.